The most immediate, aside from the name, would be the ability to select Reptite or Robot (among 7 other starting races) in creation. Also in creation, a character will select their elemental alignments, and Truce of the Guardia Kingdom is one of the 3 potential starting locations. Following along with elemental alignment, every room in the game has an "elemental field" (akin to Chrono Cross) that is influenced by various factors such as magic being cast, and has various affects as a result. The world's lore has it that three main super powers rule over the political landscape of the planet, the Guardian Kingdom being one of the three main powers. The geographical and politican "center" of the world, that acts as our ultimate neutral territory, is overseen and guarded by the immensely powerful and important Acacia Dragoons, with Termina serving as THE most central and important port town in the world. The majority of the pre-1000 AD events in Chrono Trigger informs our timeline and history perhaps more so than any of the other games that are included in our theme. We also have carefully woven various elements from across the various games into a cohesive narrative and background, including things such as Jenova from Final Fantasy 7 being a particularly powerful and notable Lavos Spawn, or even something such as our Guado race (from FFX) owing their origins to the mixing of the survivors of Zeal and the Earthbound ones. Various other elements of the series will be found throughout the game, including the infamous chests and doors that are "Sealed by a mysterious force." 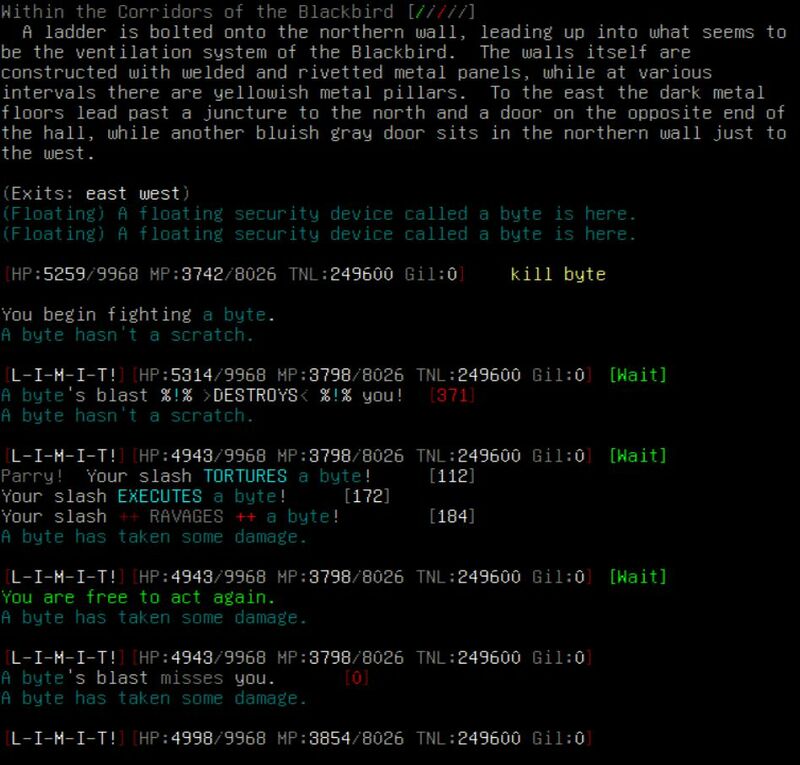 MUDs are typically played a variety of ways, including telnet (the least desirable option), a dedicated MUD client that is specifically developed toward connecting to and playing nearly any MUD (such as MUSHClient, MUDlet, and others), there are a few mobile apps out there (such as MUDRammer), and even a few web apps such as the one one MUD Portal. You can point any of those toward host 'eotmud.com' and port '4000' to connect. I thought I would include screenshots in a separate post. Although most everything is text based, there are numerous visual elements that are created using text. This is a pretty typical view of how it looks being in a town, where there is a "mini map" automatically generated based on exits to the left of a room description. We have an overland world map that connects our areas, and it, too, generates a visual element and representation of the world. The map shown on the left side of the room description is typical of anywhere on the world map, although only points of interest (in this case, being right outside of the entrance of an area) will have room descriptions. Dungeon-type areas, which are intended to be more challenging in all respects versus a town, will largely not have a mini-map associated with it, although there are exceptions and some dungeons do have maps that can obtained that unlock that functionality for that dungeon alone. Whereas our world, its map, etc. 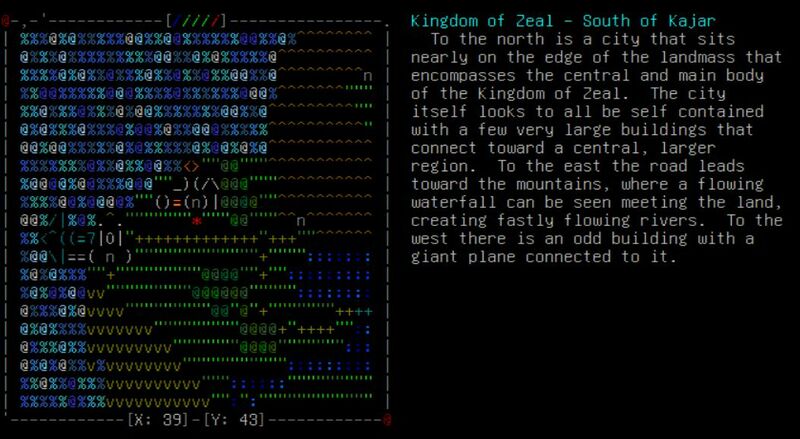 is all original (even if made up of various elements across the themes in our game), the Kingdom of Zeal was a bit of a pet project of mine in which my goal was to recreate it as accurately to the game as possible (with the exception of having added in and "completed" the otherwise unfinished Pre-Release areas such as the North Palace under the Blue Pyramid and the Dungeon that links to the Palace). This is a shot just outside of Kajar. Combat is a rather significant part of the game, so I wanted to show a relative typical beginning of a combat encounter. The "wait" state is shown that accompanies the use of various combat commands (and in this instance, the use of the kill command to begin a battle). Whenever a character is free to act again, they will typicaly have a variety of combat skills, spells, and other actions they may take. Lastly, this isn't a direct screenshot from the game, but the way we generate our worldmap is based on a graphical image where every pixel in the image is translated into a room and coordinate on the map itself. This image is a labeled version of the exact image that we load our world map from, again, with each pixel representing an individual room on the map. This version of the map has most of the major towns listed, although there are many, many more areas (mostly dungeons) accessible from the map. 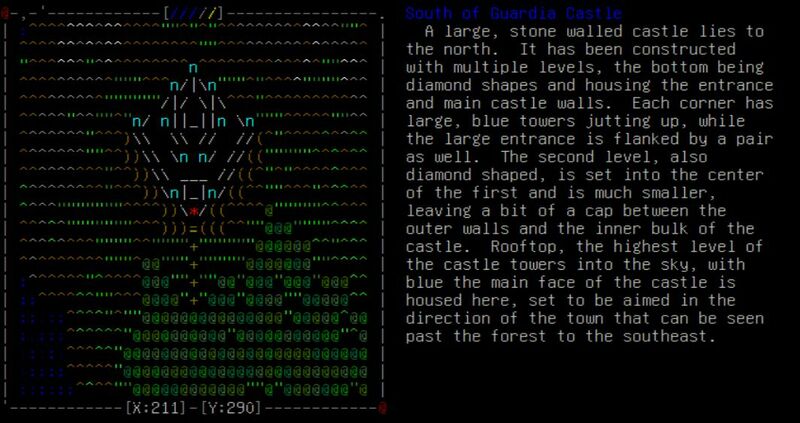 Also worth noting, the "graphical" elements shown in the other world map shots above (such as the text ASCII art that represents Guardia Castle) is not represented on this map. Oh man, I haven't played a MUD in years. This looks incredible. I remember seeing your original post, though I guess I never spoke up about it. You and your team have done a great job with this. I'd love to explore it more over the weekend. We seem to be experience some rare (and extremely unfortunately timed) issues with the server / hosting company at the moment. I've been on the phone with tech support trying iron it out, but hopefully everything will be running smooth again soon. I'll update when I have something to update. The issues appear to be fixed. I still haven't heard back from tech support, but everything seems to be running. Nice! I'm surprised I missed this post a week ago. I'm not much of a MUD player (I do remember trying a Chrono Trigger MUD about 12 or 13 years ago), but this looks great. 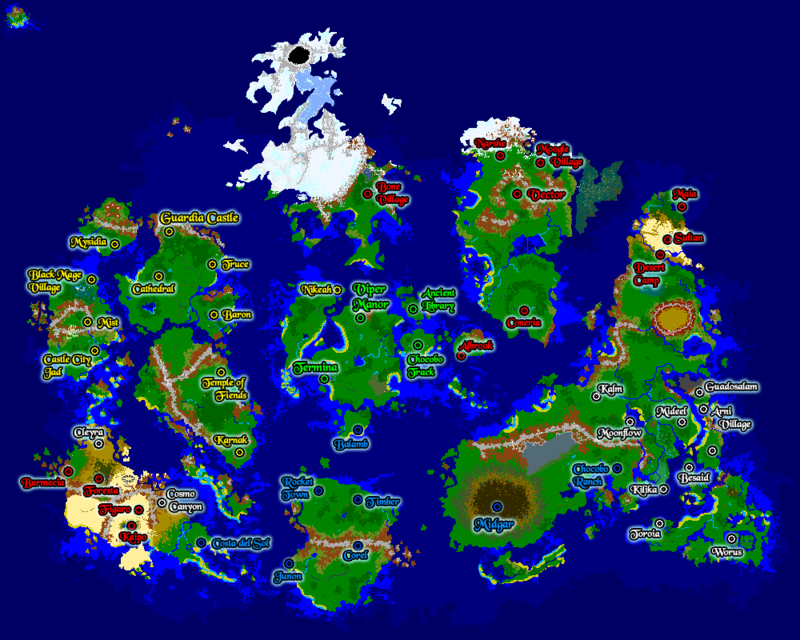 Looking at the map, I love the mix of various SquareEnix RPGs represented.